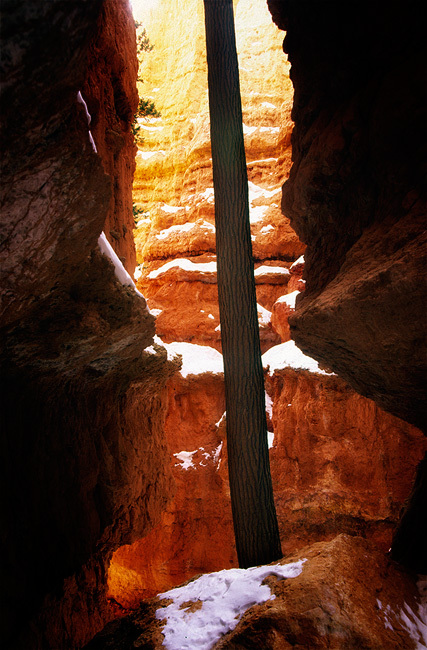 Inside Bryce Canyon, Utah last winter. always amazes me how nature can cling to the most unpromising of places. a terrific shot; the light is exquisite. very cool. love that tree growing up. I've been to Bryce and this tree is so odd! Very interesting shot with fantastic light! Fabulous capture, the lighting and tones are amazing. Makes you wonder, doesn't it? Nature does marvelous things. Excellent find and excellent capture. This is strange and wonderful as if from another world. Outstanding! It draws you right in. La luz que entra desde arriba por este agujero hace de si una foto muy bien lograda, con ese tronco y esas texturas. very great light here. The tree looks a little bit surreal in it (hard edges). You capture the most unique places. This is just beautiful. What an unexpected place to find such a tree! Wonderful glowing light in there. Dramatic scene. Nature is fascinating, isn't it? Wonderful shot. defy the laws of nature..Superbe !!! !